Further Thoughts on "The Geographic Approach"
The geographic approach is a framework for understanding and managing our earthbut it will not happen automatically. GIS professionals will play an important role in making this vision a reality. The full implementation of the geographic approach will require dedication to building and maintaining GIS infrastructure and the fostering of open sharing of information, as well as new forms of cooperation and collaboration. At the 2007 Esri International User Conference, I described GIS and the Geographic Approach because I believe this phrase describes a concept that underlies so much of what we do in the GIS field"approaching problem solving geographically." That talk was later summarized in the Fall 2007 issue of ArcNews. In this article, I would like to further explain this theme. The geographic approach refers to using geographic science as a framework for understanding our world and applying this knowledge to solve problems and guide human behavior. Everyone who uses GIS is taking the geographic approach. The goal in defining and discussing the geographic approach is to explain why geography mattershow applying geographic science to address our common problem can lead to different outcomes. For example, a person who tackles a problem using numbers, calculations, and probabilities reaches very different conclusions than someone who approaches the same problem using the principles of geography. When making far-reaching decisions that have a significant impact on our environment, the consequences of not taking the geographic approach can be critical. Geography is the science of our world, describing the physical and cultural patterns and processes of our planet. This science provides humans with awareness of what's going on, predictions of what may happen, and systematic information for planning and decision making. Geography helps us better understand various spatial phenomena and their interrelationships. For example, the relationships between climate, soils, and topographic slope can help predict agricultural productivity. These understandings can help us become more conscious and aware of the interrelatedness of our world and how our cumulative behavior is affecting the evolution of the planet. GIS extends the power of geography by providing digital tools that abstract and organize geospatial data, model geographic processes, and visualize this data and these models with advanced computer techniques. GIS is helping us apply geographic knowledge to a host of challenges, ranging from making organizations more efficient to supporting location decisions that require examining many geographic factors. For example, when selecting the route for a new highway, GIS and the geographic approach can be used to consider the physical and human factors that should guide its layout and design: the environment, existing land use, terrain, and social impacts, as well as engineering constraints and costs. Considering all these factors can be overwhelming, particularly when trying to make complex trade-offs. This is where the use of GIS is particularly valuable. A key method of the geographic approach involves integrating many factors on a map and interpreting their meaning in a holistic way by means of map overlay. This classical method was popularized by Ian McHarg in his book Design with Nature in the 1960s. The advent of GIS allowed planners to replace plastic overlay maps with digital overlays that could be integrated and modeled using various quantitative spatial analysis tools. These weighted overlays combine the various factors of importance based on scientific or human judgments related to a particular decision. An example might be a map showing the relative suitability of a landscape for locating a new facility or for a particular land use. Today, biologists use this type of approach for modeling the geography of natural habitats. Similarly, hydrologists model flooding and flood risks, sociologists model neighborhoods and social behavior, and land-use planners regularly combine these types of models to better understand how to design strategies for creating the future. This approach is being used in many other fields: by the military for cross-country mobility; by resource planners for forest management, mining, and petroleum extraction; and by city planners in organizing and managing urban growth. It's being used in disaster preparedness planning and response to fires, earthquakes, hurricanes, and floods. This approach is helping organizations provide humanitarian assistance during famines and social conflicts. Utilities are applying the geographic approach to planning, engineering, and managing infrastructure networks, and businesses use it to select the best locations, market their products, manage territories, efficiently route vehicles, and make their business more efficient. All these applications deliver huge benefits to organizations and to the rest of us. While there are clearly many direct benefits, the use of the geographic approach goes far beyond specific applications. It is already having profound effects on how we think about and understand the world, how we analyze and make decisions, our methods for evaluating choices, the way we educate our young people, how we communicate with others, our management style, and how we behave toward our environment. Yet, with all that has been accomplished, this approach has only been possible for the last few decades, so the process of applying geographic knowledge to the full range of human problem solving is just beginning. Perhaps the most challenging application will be understanding and managing global change. Our world is changing rapidly. Continuing population growth, urbanization, consumption of natural resources, climate change, and disappearing biodiversity all make for a challenging future. What is clearly necessary is to take a new approach, one that considers not just economic and political factors but also the ecological infrastructure that underpins our life support systems. We need to change how we live in our environment: reduce energy usage, cut CO2 emissions, protect/restore natural areas, reduce our consumption, and stop polluting. As valuable as our individual activities are, it is clear that the world also needs a systematic and comprehensive frameworkan approach for understanding and managing human activities in the context of the environment. This approach needs to consider all the necessary factors for creating and maintaining a sustainable world. 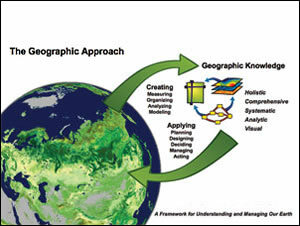 Geographic science supported by GIS technology provides just such a powerful approach. It provides a new context for thinking and behaving and for designing and creating solutions for our futurethe geographic approach. Enabling technologies that support GIS continue to get better. Computing is getting faster and cheaper (Moore's Law), network bandwidth is increasing, mobile technologies (particularly with GPS) are becoming pervasive, Web services are being accepted as the next-generation computing platform, and there is growing adoption of interoperability standards (within IT in general as well as in the GIS community). There is a growing interest in using GIS as an enterprise technology platform for strategic mission applications within larger organizations. More organizations are acquiring enterprise licenses of our technology. Examples of high-growth industries include commercial enterprises, transportation, logistics, public safety, natural resources, utilities, defense, homeland security, and local government. More executives are also asking to be included in GIS discussions. They want their organizations to be spatially literate, mapped, planned, and managed. More GIS is being made available on the Web. Popular Web sites, such as Google Earth and Microsoft Virtual Earth, have introduced more people to the world of mapping and visualization, but the public is interested in seeing more. Our users continue to create Web sites and, in the future, will be interested in mashing up their services against these global visualization environments. GIS systems are getting bigger. They are holding and managing more information; supporting more applications; and, as a result, leveraging data investments and providing more benefits within organizations. The volume of geospatial data that's coming from many sources is growing exponentially. Geographic measurement is being driven by both new technologies (e.g., more satellite and airborne digital cameras, more lidar, GPS, and other digital surveying devices) and more deployment of these technologies. All of this measurement is creating more precise and comprehensive data for GIS professionals to work with. GIS data is being increasingly packaged into ready-to-use products. Esri has recently released a complete data appliance for globes and maps that can be set up behind the firewall for use within organizations. There is more awareness of GIS. More people understand not only the power but also the value of integrating GIS data into the workflows of their organizations. Part of this is being caused by consumer-mapping Web sites, as well as the good work of our users. GIS software continues to evolve and expand. The most important trend here is the expanding applications of server GIS. This technology shift (business logic on the server) is providing a platform for extending the desktop environment and providing a much faster and easier integration within the traditional IT infrastructure. Server GIS also provides a new approach for implementing collaborative GIS networks (spatial data infrastructures). For example, in a local government, a GIS system can now consist of a network of distributed GIS workgroup servers integrated with a central enterprise server that automatically replicates data and provides traditional warehouse functions, driving support for cross-cutting applications. At the research frontier, GIS is being integrated with sensor networks that precisely measure changes that occur in real time, such as temperature, soil moisture, water flows, changes in microclimates, plant growth, and other conditions. These sensor networks are being connected directly into GIS systems, such as the hydrologic information system developed by the Consortium of Universities for Advancement of Hydrologic Science (sponsored by the U.S. National Science Foundation). There is a growing and thriving GIS business environment. Esri and its partners are a good indication of this. We believe this growth reflects the expanding interest and success of our users in nearly every field. While it's not always obvious, we believe GIS technology is helping improve many aspects of both our human society and our interaction with the natural world. We believe that GIS is still at its beginning. In the future, our users will build more comprehensive systems that serve not only their internal organizations but also other agencies and society in general. This will result in enormous benefits. The new Web services architectures and collaboration tools will allow users to work together in new ways and deliver more cross-cutting approaches to problem solving. Despite its great success, the widespread application of the geographic approach will not happen automatically. It will require continual dedication to building and maintaining GIS infrastructure (quality databases, strong Web applications, and all the related workflows). In addition, we will need to foster open sharing of information and new forms of cooperation and collaboration. Clearly, GIS professionals will play an important role in making this vision a reality.